George Soros used to be the best-kept secret in the news media. Journalists trained to “follow the money” wouldn’t find the millions he gave lefty causes with map and a compass. The New York Times ran at least 11 news reports and 7 columns or editorials attacking Facebook after learning that the company commissioned research about Soros. Soros had called for regulations on the company, yet the Times found this act controversial and worthy of condemnation. Soros jumped into the limelight this year, granting interviews and saying, “Everything that could go wrong, has gone wrong” from Trump’s election, to Brexit and other geopolitics. He commited to “redouble” his efforts — which already total roughly $900 million per year in donations to groups around the world and spent at least $15 million helping the left in the 2018 midterm elections. Soros definitely can afford his own PR operation, but why pay for something he can get for free. 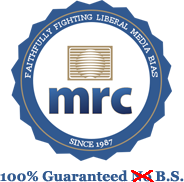 The MRC has been struggling to square Facebook's attacks on Soros with its own insistence that Facebook censors conservatives -- something that Facebook's hiring of an oppo-research firm to go after Soros would seem to undercut. Seymour also complained that media outlets called out newly appointed Trump economic adviser and former TV personality Larry Kudlow for failing to anticipate the 2008 financial crisis, which sheinsisted is "a cheap shot since Wharton Business School says many bankers, regulators, the Fed, politicians, journalists and economists did that too." Actually, Kudlow has been wrong about a lot of things, the recession being just one, in which he flamboyantly declared in December 2007 that the economcy would continue to roar ahead and those prediting a housing bubble were "bubbleheads." Yes, Wharton did note that a lot of people didn't predict the recession, but the also noted that unlike Kudlow, "many economists did spot the housing bubble, they failed to fully understand the implications. Seymour is just making excuses to shield Kudlow from his history of bad decsions.